How do I pose MMD models to look natural? Natural poses are easier to make if you have a reference picture. 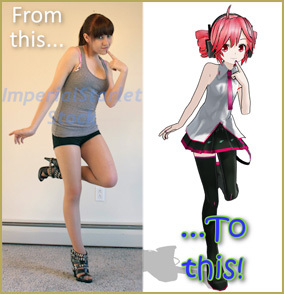 Where can I get pictures to help me pose MMD models and dancers? Poses are an important aspect of MMD. No matter how pretty a model is or what sort of effects you use, any model will look better with a great pose. Don’t worry! It’s not as hard as it sounds. Once you learn the tricks to posing, it’s way easy! First off, you’ll need a reference image. If you want a pose to look natural, you’ll need a reference. Sometimes it’s ok to do things “by ear” (UTAU lingo slipping into my MMD stuff again!) if you’re doing a very simple pose, but until you become very familiar with natural posing, it’s best to use a reference for most poses. One of the best places to get them is DeviantART’s resources and stock images section. Like any resource, it’s important to make sure it’s ok to use the images even for pose references, so it’s usually best to look in the stock images section (Unless it’s a well-known image like Meiko’s boxart or that one picture of Riza Hawkeye with her smaller gun). The best section for pose references is Resources & Stock Images>Stock Images>Model>(Whichever category you like here)>Full Body. Then you can flip through the pages, or if you want something specific, put something in the search box and it’ll give you the results for just that category. One of my favorite places to get references is ImperialStarletStock’s gallery; They have a huge variety of full-body poses you can use, and pretty loose rules. Plus, they mostly wear skin-tight clothes, so you can see how the body is positioned without bulky clothes or poofy skirts getting in the way. The only downside is that many of their photos are set so only signed-in DeviantART members can view them, so if you don’t have a dA account, go to DeviantArt.com and get one! But if you do, I highly reccomend looking up their page. Once you have your reference photo, open up MMD and load your model. You’ll need to see the reference image while you work, so it’s probably best to shrink the window enough that you can put it on the side of the screen while you work in MMD. Or, if you have two monitors like I do, you could put the photo on one monitor and MMD on the other. Or you could print the photo and keep it in front of you … or use that photo to make a background image you can use in MikuMikuDance; Go with whatever works best for you. Now let’s talk a little about MMD anatomy. Most models (with some exceptions such as Hachune Miku and Tako Luka) are humanoid. Sure, their shape is often somewhat different from real life, but that’s the nature of art. Just like a homunculus, they might not always be totally human, but their anatomy is more or less humanoid. What this means for you is that almost every bone in an MMD model corresponds to a joint on a real human. Every bone has its own axis. Assuming you have the rotation set to local and not global, you can use the little Red-Blue-Green X, Y and Z buttons in the corner of the screen to rotate the bones on their own axis. This will make it look much more natural than using the “Rotate” tool, which rotates from the camera perspective. -Never use the rotate tool. Since this rotates the bone based on where the camera is, it’ll almost always end up horribly unnatural. Always use the Red-Blue-Green buttons to adjust the bone’s natural axis. -Use the groove bone (Center Bone) to shift the model’s center of gravity to match the image. This can seem a bit tricky, but with practice it’s not that hard to do. For example, if your model is leaning against a wall, move it back and slightly down. If your model has their knees bent, move it down. -Speaking of bent knees… it’s usually a good idea to move the groove bone down a little to bend the knees ever so slightly. This will make your model look less stiff. -Always move the camera around to check how it looks from different angles. Something what looks great from one angle may actually be quite wrong. Different angles can reveal many things. Hold down the Right mouse button and drag to quickly see all sides of your model. -Never ignore the shoulder bones. This is one of the biggest mistakes I see in newbies. Everyone thinks the shoulder bone is useless, but if you watch a person move, you’ll see we actually use our shoulders for many different positions. Subtle changes in the shoulder bone can make a huge difference in the look of your pose. -Other bones that may seem useless but require attention are the neck bone, eye bones, and the orange bones that rotate the legs and feet. -For things like hair and clothes that aren’t in the picture, just make sure none of them are going through the model. Try to make them flow over the model as naturally as possible. Move the Leg IK bones … the feet appear to be “glued to the floor” until you move them. One more note … I searched Google for “strike a pose” and looked at IMAGES … hundreds of nice poses there. Your tip about moving the center bone down just a bit to relieve the apparent stiffness of the model is a great bit of info. I have often used that trick to help the model look more normal, more comfortable. The little flex in the knees looks so less rigid, more lifelike, compared to a freshly-loaded model.